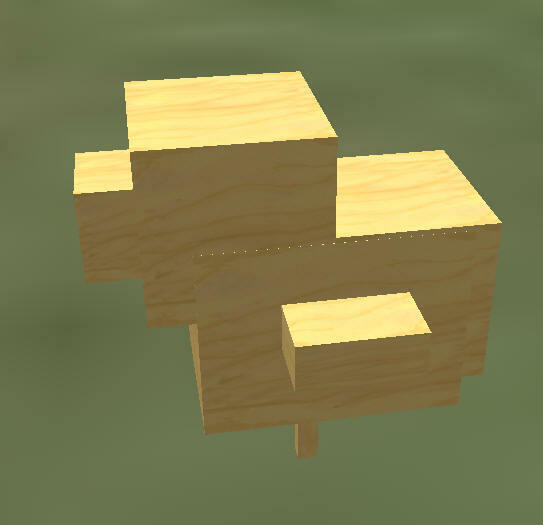 Previous:Making a homing bird feeder for a breedable pet in Second Life. This photo is the original XS pet Quail. It is happy and well fed as it is shiny and glowing. In this article, you will assemble a similar quail. Quail are similar to other breedable animals on the grid. They can be bred for colours. They have two colours, body and tail/wings, with the initial generation quail sporting colours of red, green and blue to start off with. Since the original XS Quail is no longer available, I puzzled over how to make one without any instructions or guides on dimensions. Luckily, Xundra Snowpaw, the author of the original XS Pet, left behind some code that grows the birds in size. This code must be modified if you plan on making another animal. Personally. I would not do it this way. I would use an algorithm to resize and re-position the animal as it grows such as is used in my Single Script Prim Animator instead of tables of numbers as Xundra did here. Its is not an easy thing to do as it involves rotations and repositioning along with resizing, but it would be a much cleaner and more portable solution for other pets. I have modified this code into a new script that makes it simple to make a new pet bird. 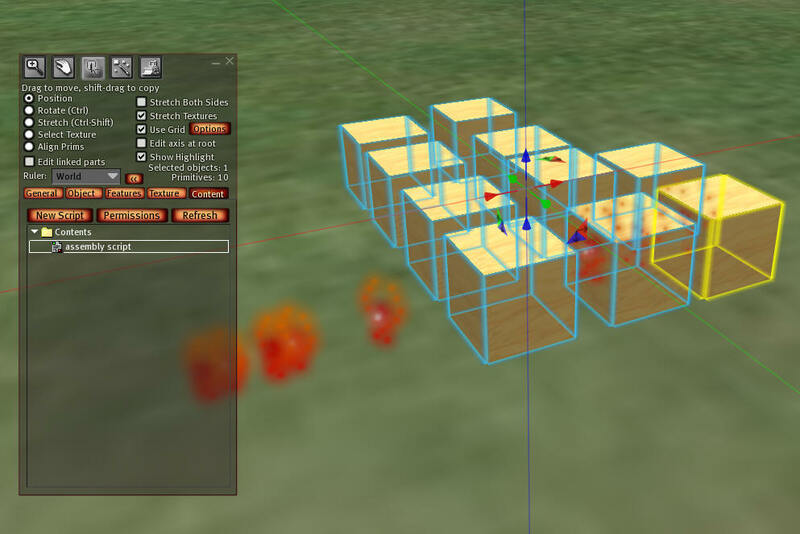 First, you need to rez 10 prims on the ground.Once you have them in place, link them all together with Ctrl-L. It should look something like this and you can use any size or position. Now edit the linked set and add this script to it. The script will automatically size and position your prims into a XS quail shape. Once the script runs, you will end up with a small, cubical pet bird. You can now delete the bird assembly script. Isn't it cute!There, you just made a bird for Minecraft!So my job is done. Oh wait, this is a Second Life lesson. Dang. I like Minecraft, even though I have never played it. You should not resize, or move any prims.The bird grows from these sizes and positions and becomes larger and larger. If you wish to use this for another bird, you will have to correct all the size and positions. But you can change the colors, shapes and rotation of any prim. The breeding process will change the body, head, tail, and wing colors, so you can leave them all white for now. 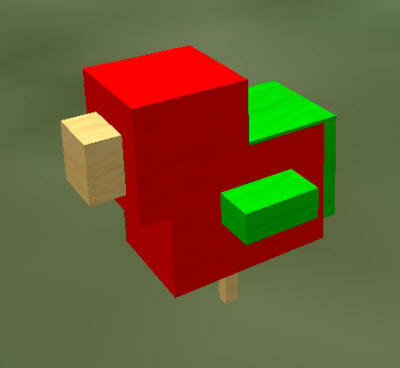 Now edit each part and set the shapes and rotations for each part. 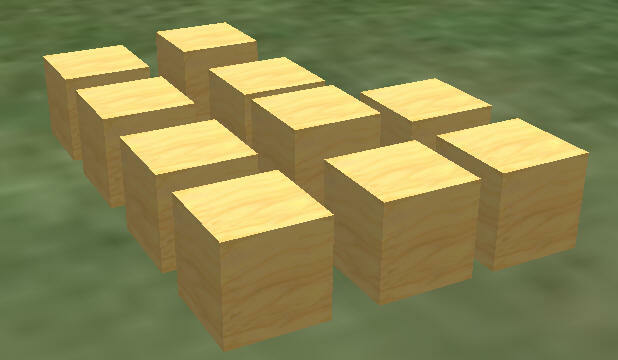 Do not move the prims or resize them, but you are allowed to rotate them and change their properties. Put a copy of the Homing Post inside the bird, too. One of the menu options when people click their bird is to get a copy of the Homing post. Note: This bird must be named 'Quail'. You will need a bird sound. It must be named 'bird_sound'. I used this 'wark' sound. You can get great free sounds at http://www.freesound.org. 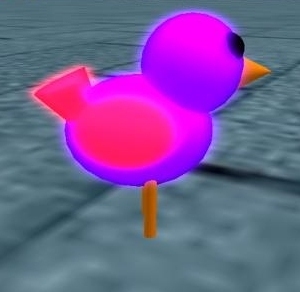 Upload the sound and add it to the bird's root prim. Important: all of these scripts must be named correctly! Put all the scripts EXCEPT xs_brain inside the bird and compile them. They MUST be named correctly, or the bird will die and delete all your scripts when xs_brain is loaded! Add the xs_brain script and compile it. Update 11-15-2011 - The modified xs_breeding v 0.24 had a script mistake in it that I made. It is now at V0.25. I have resaved the zip file on the web site, and am including a copy of the entire script here after this detailed spot where the problem is. If you rez the bird, it will die. Birds must be born from an egg, or they must be reborn from a Ccryo-crate. If you have done this step correctly, all your scripts will still be in the bird. They MUST be named correctly, or the bird will die and delete all your scripts when xs_brain is loaded. If you are missing a script, then the bird will switch to state 'dead' and remove the scripts. If you rename any scripts, you must also change the code in xs-Brain that checks for the correct scripts. This was apparently done as a security measure, so that anyone who added a script or tampered with the pets would end up with a dead bird with no scripts. The line of code that does this is Line 292 in the xs_brain. You can add a // comment to the front of this if you wish to disable the security feature. 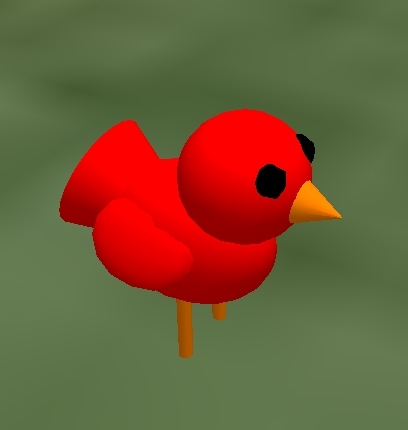 Add a copy of the homing post from your inventory to the bird. Set the permissions on the scripts in your bird to no modify. You should also set the outer-most permissions of the bird to no mod so that people cannot put scripts inside your birds to feed them. Now that you have assembled the bird, take it into inventory. In the next section, you will put it into an egg. Each bird must be stored in an Egg or a crate. Birds must be rezzed from a Egg or a Crate.The next lesson will teach you how to make an egg and from it, give birth to your first baby bird!